Starting a new fitness routine can be exciting, but continuing a new fitness routine can be challenging when you aren't seeing the results you want! 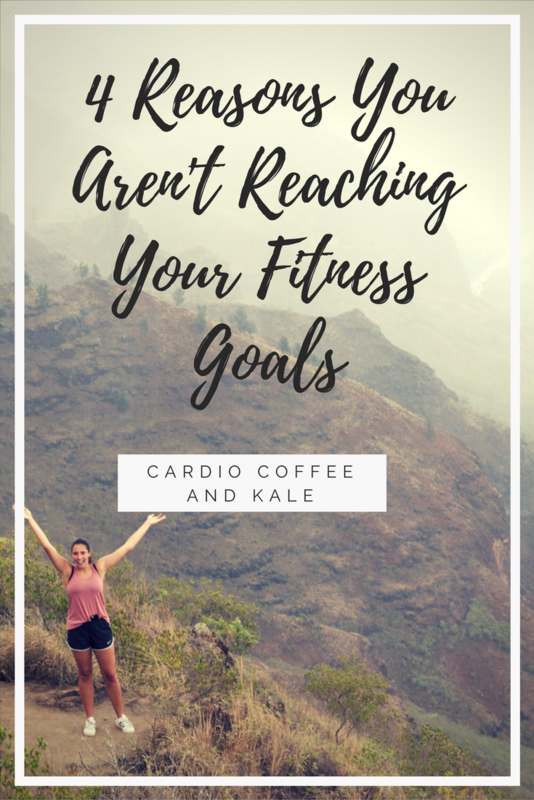 Here are 4 reasons you may not be reaching your fitness goals. It just might not be happening as fast as you had hoped for. Meg and I teach a fitness class full of wonderful women, and when we asked one of the ladies, who had been attending for about two weeks, how she was doing, she very wisely replied, "I just have to remember, it took me over twenty years to get this body...it's going to take a while to get back in shape." Lasting change does take time, so don't get discouraged! It is sometimes slow and we can't see it happening before our eyes, so we assume it isn't happening at all. It is! Maybe you will go to try on a dress you haven't worn in a while and it has "magically" gotten too loose, or realize you went up and down the stairs without getting winded for the first time. Maybe you will go to stand up from sitting on the floor and realize you didn't need to grab onto something to help yourself up, or perhaps you were able to lift heavier dumbbells than when you first started. These are all changes, tiny glimpses of an evolving body that is heading down a path toward healthier living, instead of away from it. We had a client send us a picture that brought a smile to our faces! She had gone into her closet to get out the next season's clothes and realized none of her shorts fit...they were all too big. She didn't necessarily realize how significant of a change there was in her body daily because it happened slowly over time, but it was changing! She could see just how much it had changed when she tried on her shorts! Be patient - your body is changing! Most people tend to overestimate the caloric burn of a workout, and underestimate the calories of the food they eat...the result is sometimes people actually gain weight when they start a new fitness routine. Many people workout and then reward themselves with a special treat afterwards, but they don't realize that the reward actually has a lot more calories than their workout. It's easier to eat 500 calories than to burn 500 calories. For example, a Venti Iced Pumpkin Spiced Latte from Starbucks has almost 500 calories, or you could run 5 miles to burn off that 500 calories. It is much easier to sip the latte than to run 5 miles. When you reward yourself with special treats that you might otherwise avoid, you are at the very least cancelling out any of the weight loss benefits of the workout...which can be why you aren't seeing the changes you had hoped to see. (You can read more about that in the article Is Your Workout Making You Gain Weight). Associated with combating a host of diseases including stroke, type 2 diabetes, depression, a several types of cancer, and arthritis. Don't get discouraged! Change is happening, you just have to be patient, and perhaps broaden your fitness goals beyond weight loss. A healthier your body is... the more positive your outlook is! Celebrate becoming more healthy and enjoy the ride, you won't end up where you started, and one day you'll look back and realize just how much you really have changed! Would you like to get updates about our recipes, workouts and fitness tips? Just fill out the form below! Subscribe to our newsletter to get the most up to date workouts, recipes, and promos. Photos from this website may not be used without permission, credit, and links to the original page that the photo appeared.